Aerospace historian Scott Lowther has made a career and a place for himself in his field. Lowther’s steady stream of research, illustration, publication, and design examine the remarkable conceptual fertility of aerospace firms, chiefly American, during the twentieth century. 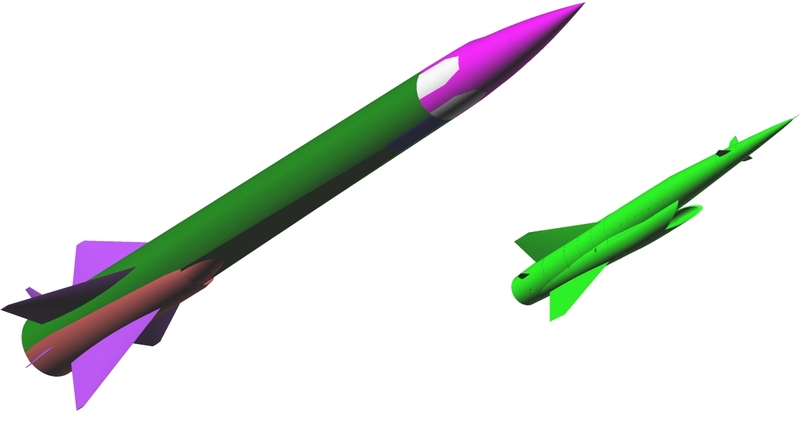 One concept Lowther recently turned up seems too incredible to be true, but is attested to by two briefings and some basic data about a certain conceptual design for a new missile. The idea was straight out of British puppet TV shows like The Thunderbirds: a crewed submersible nuclear ramjet. That mouthful refers to a concept Convair (now part of General Dynamics) developed as part of U.S. Air Force-funded work on nuclear-powered missiles. Until the “nuclear triad” of crewed bombers, land-based ballistic missiles, and ballistic missile submarines entered service at the dawn of the 1960s, the American military-industrial complex explored many sometimes strange ways of fighting a nuclear war. These included forward-based seaplane strike forces, air-launched ballistic missiles and atomic bazookas. One idea pursued with vigor from 1957 to 1964 was the nuclear ramjet. In this elegantly simple machine, a flow of supersonic air from the missile’s flight passes through a nuclear reactor core and is heated to ferocious temperatures. The resulting thrust from the expanding gas propels the missile forward, sucking up more air as it flies. A cruise missile could dispense with the heavy radiation shielding need to protect a crew from the reactor and achieve astonishing performance: 100,000-mile ranges at Mach 3+ speeds, week-long loiter times, bomb payloads greater than a B-52’s. The project was called Supersonic Low-Altitude Missile or SLAM; the nuclear ramjet engine program was named Pluto. Run out of Lawrence Livermore National Laboratory, Pluto produced two prototype engines tested at the Nuclear Rocket Testing Station at Jackass Flats in the Nevada Test Site. The second prototype, TORY IIC, delivered some thirty tons of thrust at 560 megawatts of thermal power in 1964. By then the advent of intercontinental ballistic missiles and the ballistic missile sub both obviated the need for a super-fast, viciously radioactive flying weapons platform and SLAM was canceled. But along the way, perhaps around 1960 or 1961, Convair considered taking the concept much further—to a crewed aircraft. And not just a crewed aircraft, but a submersible one at that. From briefing materials and diagrams, Lowther was able to deduce the basic form and layout for the proposed vehicle. Roughly twice the size of the locomotive-sized SLAM, the Submersible Nuclear Ramjet (SNR) would have been the size and shape of a space booster - long, thick and narrowly finned—with an aircraft-style cockpit in the nose. The SNR had to be lengthy to keep the crew as far away from the nuclear reactor as possible. It also had to be big to accommodate its propulsion, engineering, payload and crew. With the magic of nuclear power, however, size didn’t matter. This new weapon platform would require basic research of untold complexity, from hydrodynamics to selecting materials for the aircraft’s proposed flight profile. Hull alloys, reactor components, avionics, and life-support all had to cope with not only supersonic flight and high radiation but undersea operation as well. This was because the SNR was to begin its deterrent patrols as a submarine. Cruising underwater by sucking in seawater, passing it through the reactor and expelling it for thrust, the SNR would make up to 100 knots submerged. Like boomers, though, the SNR would lurk quietly until summoned from the depths. Then the nuclear-powered “water-ramjet” would convert into a rocket as stored seawater heated to incandescence propelled the SNR out of the sea and into the sky. Once aloft the crew would fly the SNR in a profile much like the SLAM: high-speed, high altitude transoceanic transit, then dropping to treetop level at Mach 4 for the attack run. As the crew piloted their doomsday weapon across the Soviet Union and conducted nuclear strikes, the engine aboard their aircraft would spew lethal amounts of radiation and fallout while breaking eardrums and starting fires. But since the SNR had pilots and weapons officers aboard, it wouldn’t end its apocalyptic flight with a sacrificial crash. Instead, the crew would fly their craft out of the target regions and back out to sea. There, perhaps masked by fog or storm, the SNR would switch over from ramjet to rocket power again and up-end itself to sit on its tail. The crew would ride the SNR’s exhaust and folding air brakes gently down to the water, much as SpaceX boosters do today, then into the ocean as empty tanks flooded with seawater. Hiding beneath the waves, it would try to escape retribution for the ruin it rained. “Ambitious” seems an insufficient word for Convair’s wonder weapon, but the San Diego company always had ambitious ideas, and many of them panned out. Along with dreams like the Submerged Nuclear Ramjet and the Model 49 AAFSS, Consolidated/Convair produced realities like the PBY Catalina, the B-36 and the Atlas missile. California dreaming, indeed.